Posted Jan 18, 2018 by Eds. 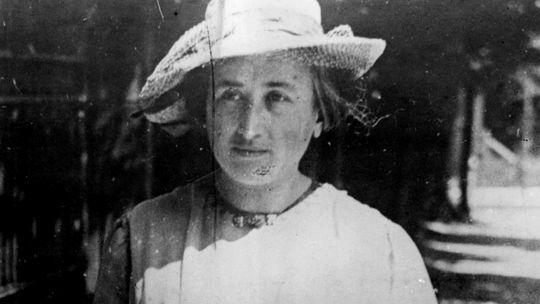 Rosa Luxemburg [1871-1919], the Polish-born revolutionary and writer, was one of the most original theoretical minds of the early twentieth century. Her work stands as a testament to the great social of upheavals of the time and a life lived in struggle for a better world. She ultimately suffered for her convictions, spending time in jail between 1904 and 1906 and again for three and a half years for opposing the First World War, before her brutal and untimely death in 1919 at the hands of the proto-fascistic Freikorp. Today we have an extract from The Letters of Rosa Luxemburg that shows her characteristic mix of astute political and social analysis and incredible compassion for her fellow creatures. The letter, written around Christmas 1917 from her prison cell in Breslau to fellow SPD-member Sophie Liebknecht, relates an incident in the prison courtyard between a guard and a buffalo carrying piles of torn and bloodied clothes sent from the frontlines. Oh, Sonyichka [Sophie Liebknecht], I’ve lived through something sharply, terribly painful here. Into the courtyard where I take my walks there often come military supply wagons, filled with sacks or old army coats and shirts, often with bloodstains on them … They’re unloaded here [in the courtyard] and distributed to the prison cells, [where they are] patched or mended, then loaded up and turned over to the military again. There are said to be as many as a hundred of these animals in Breslau alone, and on top of that these creatures, who lived in the verdant fields of Romania, are given meager and wretched feed. They are ruthlessly exploited, forced to haul every possible kind of wagonload, and they quickly perish in the process. —And so, a few days ago, a wagon like this arrived at the courtyard [where I take my walks]. The load was piled so high that the buffaloes couldn’t pull the wagon over the threshold at the entrance gate. The soldier accompanying the wagon, a brutal fellow, began flailing at the animals so fiercely with the blunt end of his whip handle that the attendant on duty indignantly took him to task, asking him: Had he no pity for the animals? “No one has pity for us humans,” he answered with an evil smile, and started in again, beating them harder than ever. … The animals finally started to pull again and got over the hump, but one of them was bleeding … Sonyichka, the hide of a buffalo is proverbial for its toughness and thickness, but this tough skin had been broken. I stood before it, and the beast looked at me; tears were running down my face—they were his tears. No one can flinch more painfully on behalf of a beloved brother than I flinched in my helplessness over this mute suffering. How far away, how irretrievably lost were the beautiful, free, tender-green fields of Romania! How differently the sun used to shine and the wind blow there, how different was the lovely song of the birds that could be heard there, or the melodious call of the herdsman. And here—this strange, ugly city, the gloomy stall, the nauseating, stale hay, mixed with rotten straw, and the strange, frightening humans—the beating, the blood running from the fresh wound. … Oh, my poor buffalo, my poor, beloved brother! We both stand here so powerless and mute, and are as one in our pain, impotence, and yearning. —All this time the prisoners had hurriedly busied themselves around the wagon, unloading the heavy sacks and dragging them off into the building; but the soldier stuck both hands in his trouser pockets, paced around the courtyard with long strides, and kept smiling and softly whistling some popular tune to himself. And the entire marvelous panorama of the war passed before my eyes. Write soon. I embrace you, Sonyichka. Your R.
Sonyichka, dearest, in spite of everything be calm and cheerful. Life is like that, one must take it as it is, [and remain] brave, undaunted, and smiling—in spite of everything. Happy Christmas.